The enticing Sanctuary of Olympia is located on the east coast of the Peloponnese and is visited ideally via the secluded port of Katakolon, opposite to the south-east tip of Zakynthos. This is however quite a distance from the nearest yacht charter base, Lefkas, and a two week Ionian sailing itinerary out of Lefkas is required. From Katakolon taxis are eager to transport sailors from the port to the actual archaeological site further inland but renting a motorbike offers more freedom. The palaestra with the adjacent gymnasium ↑ This 66 m square edifice was erected near end of the 3rd or beginning of the 2nd century BCE - in ancient Greece this building was devoted to the training of wrestlers and other athletes. Alfeios river - the longest river in the Peloponnese - begins in central Arkadia and flows via Olympia in the Ionian Sea. The river Kladeos (named after the water-god Κλάδεος) flows from the north, through Olympia and empties into the Alfeios River. 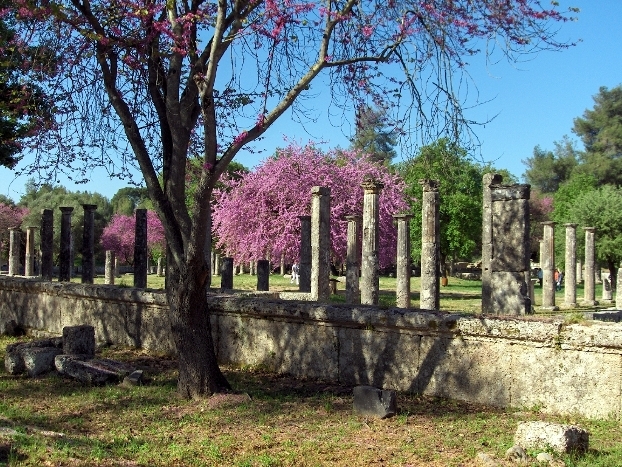 The river Kladeos has flooded the site and town of Olympia many times in history. 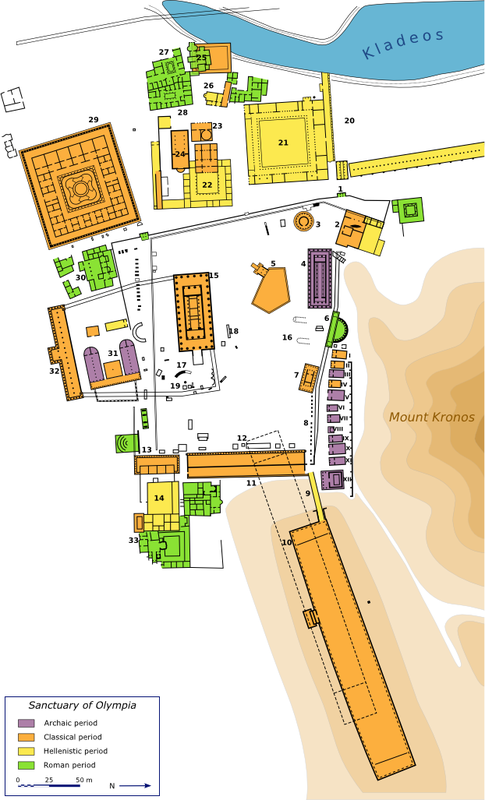 The site is home to a wide variety of buildings ranging from treasuries at the base of the Kronos mountain and temples of Hera and Zeus, a hippodrome and even a later stadium - the origin of the olympic games. Especially ancient temples and archaeological sites such as Olympia make sailing in Greece so grand and spectacular. Reputable yacht charters from Kos, Athens and Lefkas give the best access to these historical sites. A further possibility is an advanced 3-week itinerary: there are often options for yacht charters out of Lefkas towards Athens and sail along the whole of the southern Peloponnese. 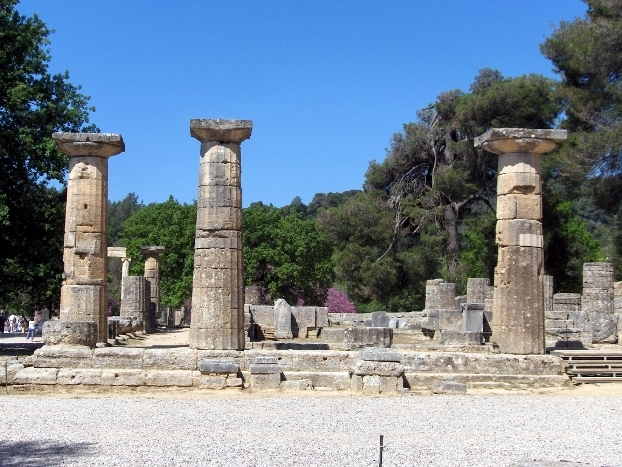 The ruins of the temple of Hera ↑ - hidden within the lush landscape of pine, olive and maquis - is the oldest peripteral temple at that site, and one of the earliest Doric temples in Greece: erected c. 590 BCE.